Juan Mata netted twice but the Red Devils were thwarted at the last by Harry Maguire's 94th-minute equaliser. In many ways it summed up Manchester United’s season so far. Stylish for short spells and looking in command for the most part but just not quite good enough when it came down to it. The 2-2 draw at Leicester City was their 2017-18 campaign in microcosm. 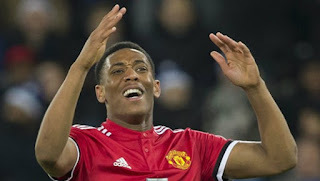 United have 42 points at the half-way mark and, in many another season, that would be enough to see them in contention for the Premier League title but not only is this a campaign like no other thanks to the exploits of Manchester City but they have also been their own worst enemy on occasion. Having pegged Leicester back and then taken the lead thanks to Juan Mata’s double, United should have taken all three points against the 10-man home side after Daniel Amartey’s second-half red card. But, after awful misses by Anthony Martial and Jesse Lingard, they just couldn’t close it out.